Distance education is primarily a method for knowledge enhancement without stepping out of work. Technology, being its critical element, helps student’s access teachers who are geographically far away to attend classes or who cannot take classes during work hours. 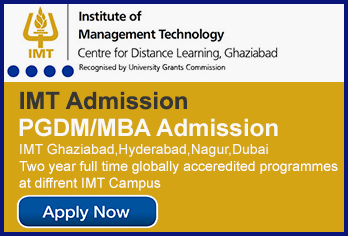 Various courses are provided through distance education, MBA being one of the mostly opted subjects. This helps in increasing business knowledge, master new management skills. The courses offered for the MBA programs are approved and accredited by the UGC- Distance Education Council. Many universities provide MBA courses with various specialization areas and the duration being a minimum of 6 months to maximum 2 years of courses. MBA is one of the most demanded distance post – graduate programs in India because of its flexibility in managing studies and classes as per convenience. This also helps individuals already working maximize their areas of knowledge without compromising on their work front. Most importantly, the fees for distance programs are affordable as compared to the regular MBA courses. Moreover, these programs are gaining more recognition among the entrepreneurs from different sectors encouraging students to add more to their experience and expertise. Narsee Monjee Institute of Management Studies (NMIMS), is ranked first among the top ten Business schools offering distance education in India. The programs under the NMIMS School of distance learning are approved by UGC-DEC. The UGC grants the institute the status of a university for its contribution towards the development of higher education in the country. The School of Business Management (SBM-NMIMS) offers a 2 year course of MBA, in four semesters with a scope four areas of specialization i.e. Finance Management, Information System Management, Marketing Management and Operations and Decision Science. The SBM educational experience aims to equip students with management skills to help them navigate through the complex business environment of today. The total fees of the course are 22,000 per semester which can either be paid at once during the admission or can be paid in installments. Considered as one of the premier business schools of the country NMIMS provides live online lectures to its students as well as organizes Personal Contact Programs for the student’s benefit. It also facilitates the students with exhaustive digital library which they can browse at any point of time to acquire information and updates. The entire program is supported with online management system where the students could do online assignments and submit their projects. With these facilities at the doorstep the NMIMS distance education course assists the students to remain intact with the business world. A leading University of the state, SGVU caters to the need of the students proficiently. It serves an excellent distance learning program which is standardized and suitable for the contemporary academic requirements. Prin LN Welingkar Institute of Management, popularly known as WeSchool, is an autonomous institution offering Distance Learning Programs in various Management courses. Founded in the year 1977, this organization is approved by AICTE and awarded “A” grade by NAAC. It is one of the top distance learning institutes of India that have been accredited by Distance Education Council, Govt. of India and is highly complimented by DEC for its quality of education and infrastructural facilities. Welingkar’s has two campuses in the country; one is situated at Mumbai and another at Bangalore. It offers Post Graduate Diploma in Management that covers duration of two years and the course in divided into four semesters. In the first year the students will be taught about the general management concepts and in the subsequent year they can study about a special subject of their own filed of interest. The total fees for the 2 year course is 4, 30,000/-, which is flexible enough to be paid in yearly installments. To be suitable for the current dynamic and ever evolving business environment WeSchool offers an up-to-date and interactive course structure. Besides developing a professional atmosphere of learning the institutes provides its students outstanding scopes of placement. Welingkar is the only distance learning institute providing a wide variety of specializations to meet with the current academic demands. It offers 18 subjects of specialization viz. Financial Management, Marketing Management, Human Resource Management, Retail Management, Operations Management, Retail Management, Supply Chain Management, Business Administration, E-Business, Banking, Investment and Insurance, International Business, Rural and Agribusiness, Hospitality Business, Media and Advertising, Services and Excellence, Travel and Tourism, IT Projects Management, and E-Commerce. With its innovative curriculum appropriate for meeting a real life business scenario, Welingkar makes a remarkable contribution towards building qualitative distance learning platform in the country and abroad. Indira Gandhi National Open University was established in 1985 with an objective to provide high quality teaching across the country through open and distance learning mode. The university is internationally acclaimed for its qualitative and inclusive education. The IGNOU management program offers a qualitative and interactive platform of learning. The school follows an updated approach to learning by providing the students printed course materials, audio-visual clips, televised programs on Doordarshan, as well as through Edusat (Satellite Programs). The total course fee for the program is 31,500/– i.e. 1500 rupees per course. A certificate of completion is given to the students after the completion of the course and if a student fails complete the course within the prescribed duration he/she could take a fresh admission in order to complete it. 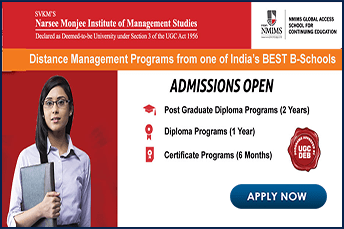 The IGNOU School of Management Studies strives to develop an educational atmosphere where students could avail at their doorstep the new and updated programs to meet demands of the current business and marketing scenario. 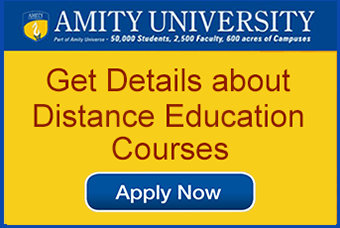 Amity University with the change in time it is able to develop and maintain the status globally with proving the quality education in distance learning mode. Various recognition awarded and achievements to Amity University by renowned bodies which makes this University as reliable institute of excellence and achievement. To Get free Counseling ,Kindly fill up the form. Established in 1929, Annamalai University is recognized as Asia’s largest Public Residential University located in the state of Tamil Nadu, India. The Annamalai Directorate of Distance Education was inaugurated in the year 1979 and offers more than 500 fields of study with the approval of Distance Education Council of India. National Assessment and Accreditation Council accredited Annamalai University with a grade of ‘A’ in 2014 for its contribution for spreading good and healthy educational standard in the country. It is credited with the largest enrollment in India and is well equipped with computers and other infrastructure, separate teaching faculty and administration, study centers, and computer training centers to serve its students. The Management wing of the university strives to provide its students an excellent scope of learning executive and managerial skills corresponding with the prevailing market requirements. Annamalai University covers 2 years of Post-Graduation course in Management degree in two mediums; Tamil and English. The students who fail to complete the course within 2 years are given an extension of another 5 years from the date of the first registration for completing it. The University provides seven areas of specialization to the management aspirants they are; Financial Management, Marketing Management, HR Management, Event Management, e-Business, International Business, and General Management. The fee structure of the course varies according to the specialization chosen. The university adheres to digital learning environment to keep the students up-to-date with latest developmental activities in their field of specialization. Personal Conduct Programs are organized by the university for the Distance Education Wings for a period of four days. The program is compulsory for all students. The candidates are required to attend at least two classes in each academic year. Sikkim Manipal University is a UGC recognized public private university established in 1995 in Gangtok, Sikkim, India. The Directorate of Distance Education of the university is considered as the best institute in India to offer distance learning courses. SMU-DE is one of the greatest modes of providing online platform of education to students as well as assuring them to receive quality education. The MBA program offers a minimum period of 2 years and a maximum of 4 years to complete the course. The syllabus designed by the university is UGC- approved which helps the learners gain application-based knowledge. SMU-DE offers four specializations under its MBA Program in the fields of Marketing Management, Information Systems Management, Human Resource Management, and Finance Management. These specializations help the learners with in-depth understanding and application of their chosen field of study. In addition to this the course also benefits its students with Self-Learning Materials (SLMs) and SMU-DE Learning App which enables them to keep track with the latest developments in their areas of study. The payment of the application fees can be done with paying the total amount at one time or can be deposited in installments. The total fees of the two year course are 80,000, which will be divided into four semesters. The students shall pay 20,000 in each semester which includes the examination fees. The SMU-DE MBA program provides an integrated perspective of management along with exposure to practical business scenarios, which is highly required for the current business market. Institute of Chartered Financial Analysts of India (ICFAI) is reputed non-profitable organization supporting in India. The facilities of ICFAI which provides a world-class education with experienced faculties. The ICFAI group provides management studies also by distance learning process. Major part of this organization is that, it attracts to the students by giving 24×7 online support and guidance. This helps the students to secure highest percentage in their subject. ICFAI has the group of 11 institutes across the country. All these universities are certified by University Grants Commission (UGC), under various sections such as section 3 of UGC Act, 1956 and Section 2(f) of the UGC Act, 1956. The 2 year course has the nominal fee structure which can be paid one-time or through the EMI. In two year students has to go through the 4 numbers of semesters. The semester comprises of 28 courses out of which 20 subjects are compulsory and remaining 8 are elective subjects. Apart from this they have also the internship program in management’s courses as like projects. By the projects students can able be a skilled professional in managements. Particulars Amount in Rs. Particulars Amount in Rs. Symbiosis Center for Distance Learning (SCDL), located in Pune, Maharashtra is one of the largest autonomous distance learning institutes in India, recognized by UGC and Distance Education Bureau. Started in 2001, SCDL has reached to the top rank among the other Distance learning Business schools in India. SCDL has been awarded by NVT Quality Certification Pvt. Ltd for its “Quality Management System” and is also certified by ISO since last six years. SCDL is one of the largest sought after Management distance learning institutes in India due to its commitment to quality education. Its highly interactive e-learning facility improvises the standard of education and makes it compatible to the rising demands of current digital marketing environment. Lovely Professional University (LPU) is the largest single campus university in the country. Located in Jalandhar, Punjab this university was established in 2005 and has affiliation with reputed NCTE, COA, PCI, IAP, BCI and UGC. LPU is among the first ten institutions in India to get ACBSP (Accreditation Council for Business Schools and Programs) accreditation which gives the evidence that it is committed to provide the highest quality business education for its students. LPU distance MBA program aims to create and establish a versatile and competent Open & Distance Learning system to cater to the educational aspirations of the society. The institute offers a 2 year course of management that consists of four semesters. Students may choose Core Specialization or Major-Minor specializations from any of the following areas of specialization i.e. LPU within a short period of operation is able to deliver affordable and accessible quality Education for the higher education aspirants through distance learning mode. Various recognition’s awarded to LPU by renowned bodies makes it a reliable institute of excellence and achievement. 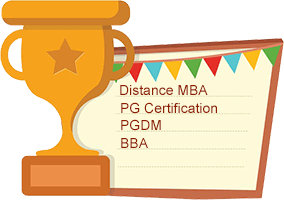 Top 10 distance education MBA universities in India 2019, Summary/ Ranking, Eligibility, Test, and Fee Structure below.